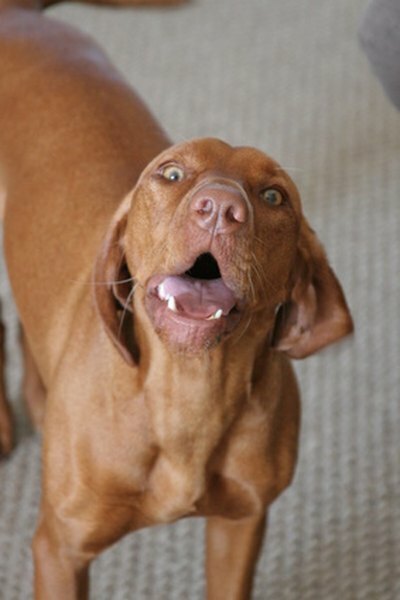 Your dog has a remarkably wide bark vocabulary. Your dog’s primary means of audible communication is his bark. As pack animals, dogs are instinctively inclined to communicate with each other by barking, even if they are from different households. Understanding your dog’s motivation for barking at other dogs is key to curing unwanted barking. Dogs learn, bond and determine social structure through play. In order to initiate play with another dog, your dog may bark. The play bark is typically a short, repetitive bark accompanied by a wagging tail, raised ears and non-aggressive posture. Fighting is often a last resort for dogs. Nature has taught them to avoid conflict unless absolutely necessary, so they’ve developed a variety of methods for dealing with problems without physical acts. If your dog feels another dog is encroaching his territory, such as the yard or the family’s spot in the park, he will attempt to warn off the other dog with an assertive bark. Territorial barking is typically accompanied by dominant gestures, such as eye contact and a still tail. A fear bark, typically caused when a dog is startled or feels under threat, is normally accompanied by a series of submissive gestures such as lip licking and head bowing. Some dogs just don’t get along. Rather than wasting energy fighting and risking injury, dogs assert themselves by barking. A bark of aggression is low, quiet and prolonged. It’s often accompanied by a growl. If your dog bares his teeth, you know he means business. At this point, if safe, you should take control of your dog and remove him from the situation. If a strange person or animal enters the yard, approaches the family at the park or appears as if from nowhere at the beach, your dog may see this as a threat. In the wild, the first response to this situation is to alert the pack, so adult dogs can assist protecting the pack and puppies can be protected. If you have more than one dog, you may notice that rather than barking at intruders, such as the mailman or paperboy, your dogs will first bark at each other. In the wild, dogs rely on their pack for hunting and protection. These are the two most essential factors in survival, so sticking with the pack is important. If your dog thinks he’s become separated from the pack, he will bark or even howl to alert them to his presence. Barking caused by separation anxiety is typically long, deep and punctuated by short periods of silence. The periods of silence, in theory, allow other dogs to respond to the barking. Why Do Dogs Bark When the Door Bell Rings?